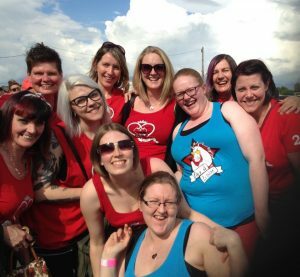 So a group of us Dolls made the trip to Nottingham on 25th of June to watch the London vs Gotham rematch. And what a rematch it was. Our road trip saw three cars full heading South in what was to become a fast food and alcohol fuelled day of roller derby. Or taxis were waiting for us when we arrived to whisk us off to Newark Showground where all the action took place. We arrived long before doors opened but still found a large queue awaiting us and, despite a slight ticketing issue, we made it in, found ourselves a space big enough for all of us on the suicide line and marked our territory for the afternoon. First mission: Merchandise! The queue for merchandise was bigger than the queue to get in, as those who had attended the boot camp earlier in the day were already inside. We made the tactical split with half staying to keep our space and half joining the line with an order list and pockets full of cash. I think we all spent more money on some amazing Gotham and London attire than we did on our tickets and accommodation. Purchases made, next stop…the bar! Once we all had a new t-shirt, a drink and some food, we settled down for the first whistle in what can only be described as an awesome atmosphere of anticipation and excitement. The level of play from both London Brawling and 5 times Hydra winners, Gotham Girls Roller Derby was just phenomenal. Both teams played a hugely defensive game with the pack only reaching us on the third corner a handful of times. The jammers had to work hard to break through tight walls and rarely picked up any points if lead jammer status was not held. Fury and I had a great time, spotting many of the tips and skills we had heard from our Stefanie Mainey boot camp earlier in the year being put into action so effectively; watching shoulders dropping within the walls to close up the few gaps that appeared, with such accuracy, it was as if each blocker had a magnetic attraction to their fellow blockers on track. With the first jam ending with a sole point to London the tension rose as did the sense that this game could go either way. By half time Gotham had gained the lead 79-41 whilst we had lost our voices. We had witnessed recycling so controlled that jammers were swallowed over and over again by the pack, and apex jumps and leaps of faith that most of us would never attempt off skates never mind on track. Once we took our eyes off the track we realised we had inadvertently created our own Scotch Corner with members of GRD and MCRD sitting near us showing that this game was well worth the journey for many more than just LDD. If the first half was anything to go by we were going to end up as exhausted and sweaty as the players by the time the final whistle went. Toilet stop complete and empty cups refilled, it was time for the second half. The noise in the venue was thunderous as London began to gain some ground on Gotham. A couple of high scoring jams began to push London closer to a win but Gotham held tight and finished the game with a 149-118 win. The excitement didn’t end there however as after the high fives and team photos it was time for us to take the opportunity to fill our phones with selfies. With the players from both teams hanging about whilst the clear up began LDD made their presence known by accosting, I mean politely asking, players from both London and Gotham to pose with us for photographs. All the players were in great spirits and happily smiled for our many cameras and we snapped away until spectators were asked to leave the venue. I must admit I was glad to have brought Sonja along for photo time as whilst I hovered politely near players waiting for an opportunity to get a photo, my drunken wife simply strolled up, stuck an arm around them and told them which way to look. Our own team photo took place in the car park after the game and is one that makes me smile every time I look at it. Road trip gang and a small hiding Loca at the back. That Saturday in Nottingham we didn’t just lose our voices but we also lost our minds. The things we saw on track that day were precise, effective and demonstrated exactly what can be achieved through determination, dedication and team work. After the game we headed back to our Travelodge and back to Burger King for a top up of fast food. More alcohol, some tea and a chat concluded our evening before we all crashed out for the night before the long trip home. Another early start on the Sunday saw us heading North for Scotland with Gotham and London t-shirts on our backs, smiles on our faces and more love for roller derby and LDD in our hearts than we thought possible.